Jesus did not, however, become something new, something he was not before this event. Rather, he manifested what he always was. He manifested the glory of divinity united with humanity which existed from the moment of his conception in the womb of the Theotokos. On the Mount of Transfiguration Christ showed humanity the archetypal beauty of its image. Christ revealed who we are and who, by grace, we are to become. He showed the deification of human nature. 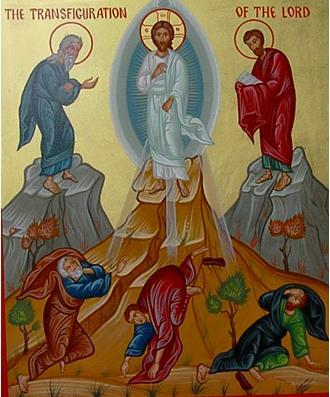 The word “transfiguration,” translated from the Greek, μεταμορφοϖ, has both an exterior and an interior meaning. It suggests a change that is visible to others as well as an inward change of a fundamental character or condition. Both meanings are important to our understanding of theosis. You cannot have one without the other. Our exterior life manifests our interior condition and our interior condition orients and guides our exterior behavior. As one moves further along the journey toward theosis the interior change and growth should be manifest and visible to others by how we live, behave, and relate. If it is not one has to wonder whether growth and movement in the direction of theosis has really taken place.